Got a fancy dress party coming up? Maybe you’re just gathering some ideas for next Halloween? Or is your little one is a massive fan of the ‘Wreck It Ralph’ movie and a costume of their favorite character would be an amazing present? Whatever the reason this article will give you an overview over the three most popular Wreck It Ralph costumes. It is only logical to start off with the movies main character! 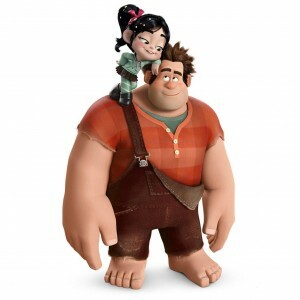 Wreck It Ralph is a big character and whilst he is set to be the bad guy in the video game “Fix It Felix Jr.” he reveals over the course of the movie that he wants nothing more than to be the hero. His clumsy and goofy appearance (and nature) means he is an excellent subject for a children’s costume. Importantly for parents it isn’t too difficult to get everything together you need to dress up as Ralph as well! The key components for Ralph’s costume are his baggy brown overalls, his orange plaid shirt, his messy hair and his bare feet. The overalls and shirt shouldn’t be too hard to find either, most children’s clothing or toy stores should stock the kind of thing you’re looking for. Obviously you won’t want your child running around a party in bare feet, so try buying a pair of sandals too to create a “bare-foot effect” that looks great! Vanellope von Schweetz, also known as ‘The Glitch’ is the hero of the video game ‘Sugar Rush’ in the movie. Her character is wacky, uncontrollable and loveable making her instantly appealing to the fan base of girls who love the film. It can be a little difficult to get all the costume pieces together to dress your little girl up as Vanellope; as you might expect from a Disney character her outfit isn’t exactly normal! If you’re working on a budget or don’t have the time to gather every last piece of Vanellope’s costume the most important components are her mint green hoodie, her stripy tights and her hairstyle. The first two items on this list are fairly self explanatory and can be found at the Wreck It Ralph Costume Store, however the hairstyle can take a little bit more effort. To replicate Vanellope’s unique hairdo you are going to want to want to buy as many bright colored hair clips and pins as possible. In the movie Vanellope actually wears candy in her hair, but this wouldn’t be practical in real life! Fix It Felix Jr. is the hero of his own eponymous video game and is set up to be the arch-rival to Wreck It Ralph. Whilst in the beginning of the movie the audience feels like they shouldn’t trust Felix he quickly becomes one of the main protagonists of the story. This is helped by his goofy personality and his comic look; a look which makes an amazing Halloween costume for children. Creating a Fix It Felix Jr. outfit is perhaps the easiest of all the characters in the movie. All you need to create an effective Fix It Felix Jr. costume is a blue shirt, a blue baseball cap and a hammer. For the full effect you may want to spray paint your hammer gold to replicate Felix’s magical one from the film! This guest post was written by Jamie from www.wreckitralphcostumes.net.